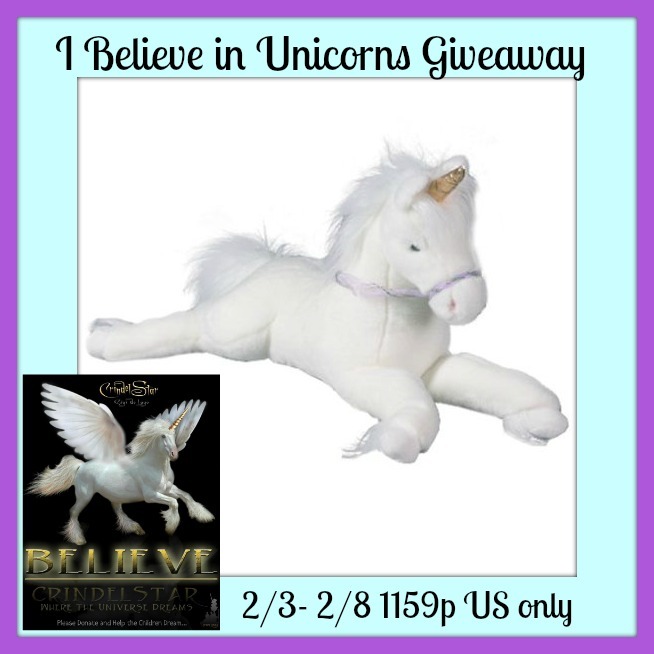 Enter to win this 27″ Stuffed Unicorn and Crindelstar Seed cards! 7 winners! Who is Crindelstar and how can you help?CrindelStar is an inspirational story about a young girl, Maria, who is facing peer pressure from her classmates to abandon believing in her precious unicorns. We learn through Maria’s encounter with a mystical creature, CrindelStar, that what she believes of herself creates the foundation of what she might ultimately contribute to the world through her life’s purpose and gift. CrindelStar arrives to rescue Maria from her despair, however, through Maria’s compassion, honesty, and personal courage CrindelStar is saved as well ! Through this Capital Fundraising Campaign – we are raising funding for CrindelStar ~ Where The Universe Dreams as we continue developing the feature film! The picture book is in production, visits with elementary school classes are being scheduled, the screenplay for the feature-length inspirational & magical CrindelStar movie is in development, CrindelStar is being translated into Spanish with an additional narration in Spanish, and CrindelStar 2013 new images represent the graphic design we have long dreamed of coming to life~ thanks to T.C. Keith ! What else is possible?Please Join all the artists & individuals now involved on this winged-unicorn’s journey to reach children & families with CrindelStar’s inspiring message of Peace & Love ! Sharing this Fundraising profile is a tremendous way for you to contribute! Donating directly or setting up a monthly donation subscription via our Fractured Atlas Fiscal Sponsorship profile page is another – there are many ways to be involved & contribute. You can also Subscribe to & Share CrindelStar’s Blog to keep up with all the news & invitations as they happen! Enter below to be one of the 7 winners! 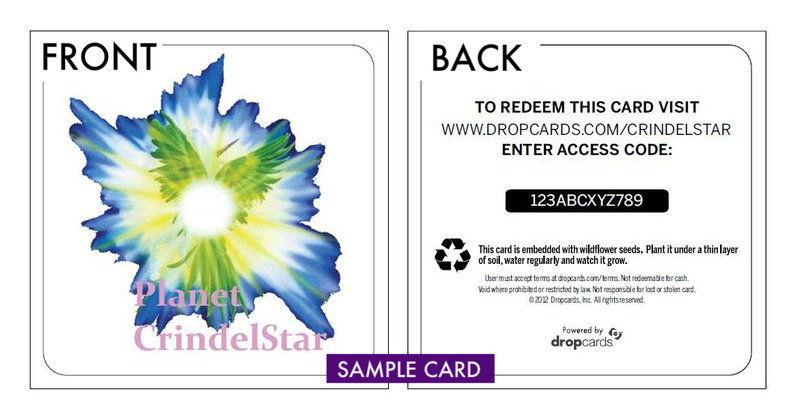 6 other winners- 2 Crindelstart Seed Cards! Ok, first of all I love unicorns, so I was immediately fascinated by this! but Wow…this is amazing… I’d never heard of this organization before, but it’s another important lesson that we ALL need to be sharing. The CD teaches children to embrace their individuality. Yall reach over 17 million a month! a great fundraiser and story. Very inspirational. I had never heard of this, so I learned a lot. Best of all the non-violance teachings. Happy donated to Ronald McDonald. Amazing charity work. That Crindlestar is a unicorn who gets saved in the end, too. I love that it teaches kids, nonviolence! wowo….so many things going on. love the song! Yes, I believe in Unicorns! (and Dragons too!) What a wonderful project. Our world would be such a nicer place if all people (not just the children) around the globe would learn to embrace other’s differences whether the difference be race, religion, or handicap and that violence only creates more hate. I’ve never seen cards infused with flower seeds. How novel! They are so beautiful though that I don’t know if I could bring myself to plant them! I hope that you exceed well beyond your projected goal. Good Luck and best wishes! I learned they want to motivate young people in the USVI and Caribbean, and want to motivate all around the world to choose a life of non violence and embrace everyone’s individuality and creativity. And make contributions. I had not heard of them before, but so happy they help children and donate to the Ronald McDonald House an awesome organization as well. I learned what amazing people reaching out to help others can accomplish. There is a CrindelStar song!! I learned that they are trying to inspire kids form the Caribbean and hopefully worldwide to choose a life of non- violance. i learned the story behind it and I think its great! I love it! and its great to see card donations have been made!!! I learned that Crindelstar donates to the Ronald McDonald House. This made me very happy!!!! The storyline sounds inspiring. I was really happy to see that CrindelStar cards have been donated to the Ronald McDonald House in Nashville and the Vanderbilt Children’s Hospital. This helps children of the VIrgin Islands.